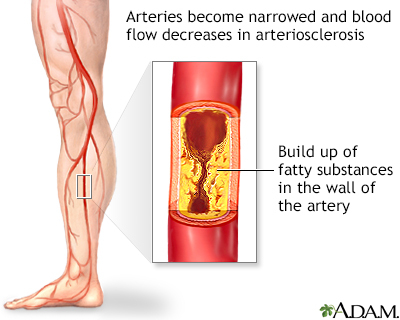 Atherosclerosis of the extremities is a disease of the peripheral blood vessels that is characterized by narrowing and hardening of the arteries that supply the legs and feet. The narrowing of the arteries causes a decrease in blood flow. Symptoms include leg pain, numbness, cold legs or feet and muscle pain in the thighs, calves or feet.